Placid elks in the forests, igloos and northern lights in the Swedish Lapland and the colourful capital of Stockholm between the Baltic Sea and an extensive lake scenery - Sweden is a true highlight among the North European countries and attracts visitors with the pride of the Vikings and pagan customs. Sweden lies in Northern Europe, constitutes the eastern part of Scandinavia and borders on Norway in the west as well as on Finland in the north-east. In the south-east you find the Baltic Sea and in the south-west you see the waters of the Kattegat. Furthermore, a major part of the east is located at the Gulf of Bothnia. Beside the mainland, over 220,000 islands belong to Sweden. The three biggest ones are called Gotland, Öland and Orust. 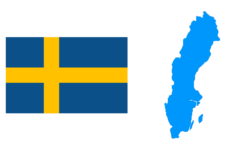 Sweden is divided into 25 provinces (landskap) and 21 counties (län). The capital Stockholm, Ghotenburg and Malmö are by far the greatest metropolitan areas in Sweden. Most of the country's area is rural and characterised by nature. The warm Gulf Stream causes a relatively mild climate despite the northern position and a lot of precipitation in autumn. The warmest time of the year is from June to August. Sweden's winters are very frosty and there is a lot of snow all over the country. The upper mountain regions in the north are dominated by polar climate. Due to the high degree of latitude, the days are particularly long in summer and very short in winter. Over 80 percent of the country are untouched and consist of wild forests, mountains, lakes and moors. The number of lakes has been estimated at 95,000 with the Vänern, the Vättern and the Mälaren as the greatest ones. The first European national park opened in Sweden in 1909. Today, there are almost 30 national parks in the country. More than half of the area is covered in conifer forests in the north as well as mixed forests in the south. The great forested areas are very old and most of them have been preserved in their original and wild nature. Over 11 percent of them are protected. Although most of Sweden's area is rather flat and hilly, the country has one magnificent mountain range - Sweden's "spine". Within this fascinating mountain world you find the highest peak Kebnekaise (2,117 m). There are about 290 glaciers in Sweden today. The largest glacier Kebnekaise has an area of about 333 km². The UNESCO also noticed Sweden's natural beauty and declared two of its regions World Natural Heritage sites: the Swedish Lapland and the skerry coast. Sweden's forests and meadows are home to numerous species of animals such as boars, deer, beavers and seals. The country's national animal, the elk, does not exist in such large numbers in any other European country. The Arctic cultivated landscape of Lapland in Sweden is a must for every lover of nature. With a bit of luck, you may be able to watch the colourful lights of the aurora borealis - the northern lights - in the north of Sweden in the Arctic winter. Another special experience is an overnight stay in an authentic igloo between October and March. A worthwhile destination is the Icehotel in Jukkasjärvi. The Swedish build the world's greatest igloo using 4,000 tons of ice in this place in November every year. It contains sleeping accommodation, a vodka bar and a reception. Travellers have until April to spend their holidays there, then the icy castle melts. Those who think that Sweden does not have any attractive beaches or coasts are wrong. Especially the beaches on the Bjäre Peninsula, the skerry landscape around Gothenburg and the deserted beaches on Fårö Island are highly suitable for children. Beside beautiful hiking and cycling trails, tourists enjoy the unique and bizarre rock formations at the island's coast. The vast skerry landscape is characteristic of Sweden. The Stockholm archipelago can be explored by boat or ferry. This gigantic network consists of over 24,000 small islands and pieces of rock. The bigger islands are vegetated by thick forest and green, the smaller ones only provide space for one seagull. Tacitus was one of the first who mentioned the country in the far north in his written work and in his "Germania" in 98. Between 800 and 1000 the Vikings ruled the great country and left traces such as the Viking settlements Hovgården and Birka, which exist to the present day. It is hard to imagine that Sweden was one of the poorest European countries until one hundred years ago. The harsh climate and the inhospitable landscape made it very difficult for the population to built a functioning infrastructure, big cities and achieve wealth. Today, Sweden is a modern hereditary constitutional monarchy with Carl XVI Gustaf of Sweden as its king. The northern country excels in architecture. The royal Drottningholm Palace with its theatre resembles Versailles' magnificent buildings and is part of the UNESCO World Cultural Heritage. Nearly every Swedish postcard shows the cosy, red Swedish house at the lake. The literature - especially children's literature - is internationally known and very successful. Astrid Lindgren created the characters Pippi Longstocking, Ronia the Robber's Daughter and Emil of Lönneberga, which should not be missing from any child's room. The Swedish are considered to live in close touch with nature. Their culture is strongly linked to the forests, meadows and seasons. They passionately defend their green landscapes against the increasing urbanisation. Cultural sights - Visby, Gothenburg and the "Beauty on Water"
Stockholm's inhabitants rightly call their capital the "Beauty on the Water". The city is surrounded by water and crossed by numerous waterways. It also has an appealing architecture, including the colourful and history-charged square Stortorget. A worthwhile attraction in Stockholm is the Vasa Museum with the worlds's greatest battleship. Another beautiful Swedish city is Ghotenburg, which can easily be reached by ship or ferry. An absolute highlight is the scenic medieval town Visby on the island of Gotland. The seaport town impresses with its old town wall, ruins and medieval architecture in the town centre. Visby is one of the most popular postcard pictures with its juicy meadows as well as its delicate orchids and poppies. The many castles such as Gripsholm Castle or the wooden farm houses in the province of Hälsingland contribute to Sweden's cultural charm. There is no other Scandinavian nation which celebrates Midsummer as exuberantly as the Swedish. The summer solstice is celebrated between the 20th and the 26th of June with strawberry cake, the Maistange (a decorated tree trunk) and wreaths of flowers. Of course, people cook and eat particularly delicious food on this special occasion. The popular Smörgåsbord must not be missing from anyone's plate. Herring, smoked eel, Baltic prawns, the Swedish köttbullar (meatballs), reindeer with cranberries and many other delicacies are served on the mainly cold buffet. The national dish is called Janssons frestelse ("Jansson's temptation") and refers to a casserole made of young potatoes and anchovies. Although the consumption of alcohol is strictly regulated, the Swedish know how to have a good time. While most natural festivities take place in rural regions, cities like Stockholm, Ghotenburgen and Malmö offer a variety of clubs, bars and casinos. In addition, Sweden is a shopping paradise and its centres and shops are even opened on Sundays from 12 to 4 p.m. Holidaymakers can relax in the classic Swedish sauna in both summer and winter. You do not only find these in the cities and in the country but also on the 600 camping grounds. Sailing, windsurfing, canoeing and rowing - Sweden is suited for a number of sporting activities. Especially the lake district in the south of Sweden offers excellent conditions for any kind of water sport. The best time for bathing holidays are the summer months from June to August. The vast lakes are very clean and invite children to go swimming and bathing. In contrast, the water temperature of the Baltic Sea does not get warmer than 16 °C even at midsummer. The many rivers and forest lakes as well as the surrounding seas make Sweden a paradise for travellers who like going fishing. The well-developed hiking paths, for example in the Sarek and Tyresta National Park, present the country's natural side. You can have a rest in one of the mountain cabins, which are also very popular with mountaineers. Sport climbing is particularly common in Sweden. The region around Ghotenburg offers attractive climbing opportunities for both beginners and advanced climbers. Given the great amount of snow in winter, it is not surprising that locals and visitors enjoy doing winter sports in Sweden. The Kebnekaise Ski Tour on one of the most difficult routes in Northern Europe takes place in April. Of course travellers can also enjoy the winter scenery in a more relaxed way. A great way of experiencing the northern country is a ride on a reindeer sleigh. Sweden can easily be reached by ferry from Europe. The country's road network is well-developed so that the car is a great means of transport within the country. If you are driving yourself, you should keep your eyes peeled in the vast forested areas. There are thousands of accidents involving elks every year. About 80 percent of the Swedish population speak English. The language is especially common in Stockholm. Before setting on their journey, travellers should change some of their money into Swedish krona. Sweden means pure nature and allures visitors into its national parks and snow in both summer and winter. In addition, the country is ideally suited for family holidays and even caters for the tastes of the youngest travellers. Relaxation, recreation and the saunas make Sweden an especially appealing destination.